★ILLUMINATE ANY SPACE YOUR HEART DESIRES: a warm amber glow specially for night strolls, nighttime gatherings or festive ceremony, reminiscent of lights seen in Italy Piazzas or the French Provence, you and your family will linger the beauty of life in the glow lighting. ★TOP-NOTCH QUALITY: ETL UL Rated for long-length or wide-area applications. The power cord is composed of 39 pcs copper wires of 0.26mm Diameter. The bulb sockets are wired in parallel circuit and cables are carefully selected to allow passage of excessive current only for short periods for safer and durable use. 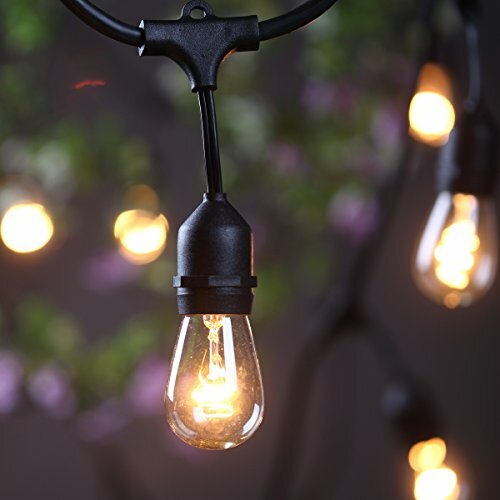 ★ADD YOUR OWN STYLE: Connect up to ten strands end to end, then custom arrange your light strings from tree to tree or in a chandelier-style cluster, or loop on the each socket through your backyard or pergola, or add a programmable timer or dimmer to set a unique ambiance for you and your guests.